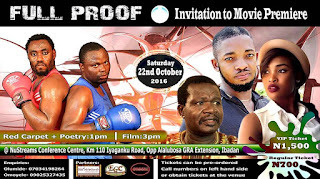 Heightened hopes were not dashed as poets, actors, critics and elite from different walks of life gathered at NuStream Conference Centre, Ibadan for the première of the much awaited movie Full Proof. Full Proof centres on the many pains of Bola, his extreme cracks to save his cancerous dying mother at the expense of his happy relationship with his fiancée and many other things in between. Why would Bola make the sacrifice of leaving Ibadan for Lagos? What was a naïve Bola’s reason for risking his life by taken up the street boxing championship with a druggie? How easy was it for Bola’s mother getting back her life? When does Abike’s sacrifice become overbearing? Where on earth will a pastor encourage and train his member to indulge in street boxing? Why does Full Proof seek to make noise about the silent exploits of cancer? The Whys, Whats, Wheres, Whens and Hows are rightly answered in the one-hour movie which is Enigmatic Olumide Bisiriyu’s first featured film which had over 50 casts and crew members and directed by Daramola Kayode Babalola, the role of the protagonist; Bola was played by Olumide Bisiriyu alongside Omolara Ayoola who acted as Abike, Bola’s fiancée. Other featured acts in the movie include the popular Christian dramatist David Kola – Okeowo, Afolabi Dipeolu, Gbenga Ayoola, Lagos-based on-air-personality, Uche Uwadinachi, Abayomi Ojo amongst others. Spicing the movie is a poetry performance by Olumide Bisiriyu - I Count and another by Samurai – Ant Race with Adewale Victor’s single This Ability perfectly bridging in a scene. 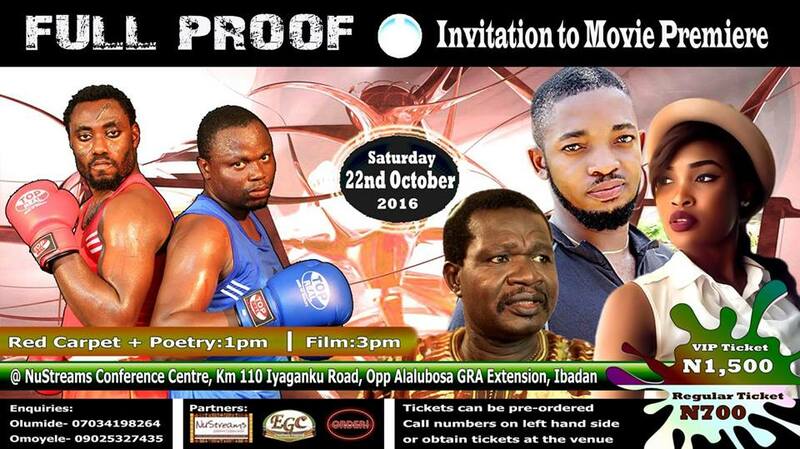 It's just a matter of days and Full Proof will show its full proof in the movie industry across Africa and beyond. Adebote Oluwaseyifunmi writes from Lagos, Nigeria.